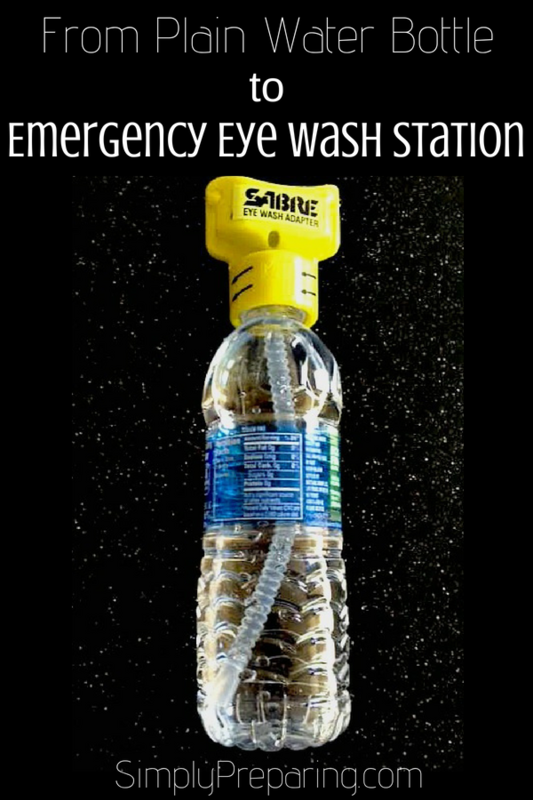 The SABRE Emergency Eye Wash Adapter turns any water bottle into an eye wash station. The unique design was created to help Law Enforcement Officers and First Responders flush contaminants from their eyes. Perfect for emergency kits, car glove compartments, EDC bags, first aid kits and more. Three simple steps is all it takes to remove contaminants from the eye, including pepper spray. Because this device flushes your contaminants out of your eye with a double stream of water, you most likely are going to get a little wet. Don’t worry. You’ll dry. Pro Tip: Our Simple 72 Hour Kit and Checklists post will give you more valuable ideas on how to compile your own emergency kits. I can remember my kids being little and getting ‘grit’ in their eyes. They simply couldn’t hold their eyes open for eye drops to relieve the discomfort, and blinking into a small cup was no better. Because the SABRE Emergency Eye Wash Adapter puts out two streams of water, it’s able to clean out the eyes faster and easier. Every summer we face wild fires on the mountains surrounding our home. The smoke in the air makes our eyes tired and sore. Being able to flush our eyes out with a water bottle and Sabre Emergency Eye Wash Adapter provides relief from the debris filled air. The SABRE Emergency Eye Wash Adapter works best on water bottles made from harder plastic, NOT the thin plastic like many store brands of water bottles. It also works great on empty, well cleaned 16 ounce soda bottles. Pro Tip: Store your adapter taped to a water bottle you know it will fit with. The Israeli Bandage was created by the Israeli Defense Force to save lives during combat. The pressure applicator on an Israeli Bandage exerts 30 pounds of pressure to a wound area, effectively treating the bleeding from a traumatic hemorrhagic wound. A sterile dressing that can be used for many kinds of wounds, it should be in every emergency kit. 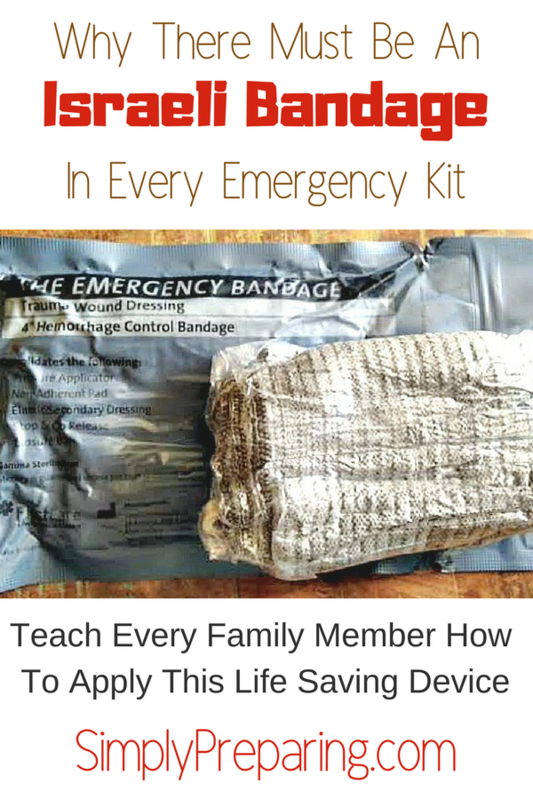 What Can The Israeli Bandage In Your Emergency Kit Do? The Israeli Bandage is highly versatile. Use it for puncture wounds, deep lacerations, and even gunshot wounds. The wrap will bind a splint in place, and used as a tourniquet. 1. First, open the outer and sterile inner packaging. 2. Next, place the sterile pad over the wound in such a way that the pressure applicator is off set, or to the side of the wound. Use the the long end of the wrap to wrap over the sterile pad, and under and over the pressure applicator, wrapping tightly. 3. Use the closure bar to keep the emergency bandage closed. Confused? Don’t worry. You’ll find the simple to follow directions for the emergency bandage on the back of every package package. PRO TIP: Purchase an extra Israeli Bandage to practice with. Also, teach your kids how to place an Israeli Bandage. 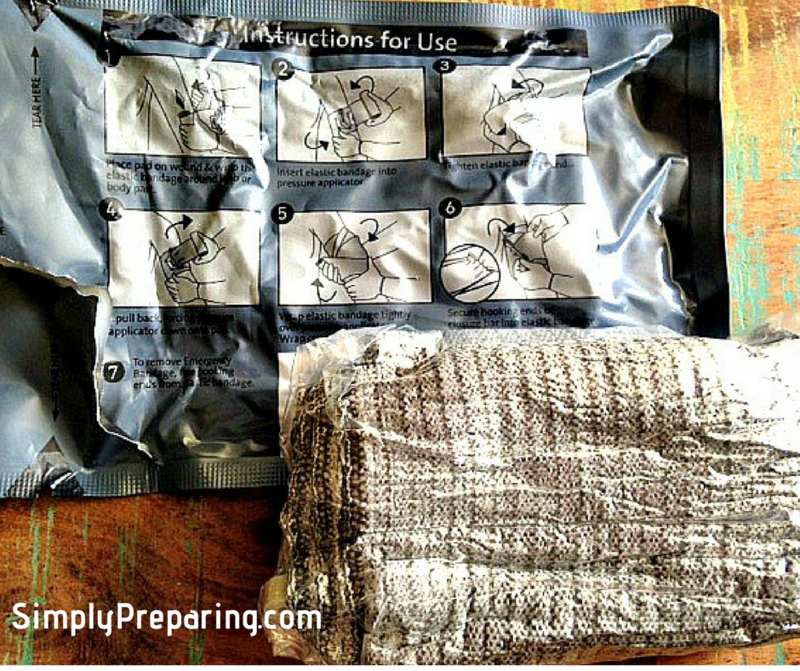 How This Bandage Can Save You Money and Space In Your Emergency Kit. Because you add this emergency wrap to your first aid kit, you can remove triangular bandages, large dressings, and bulky rolls of gauze. What Sizes Do Emergency Bandages Come In? 12 inch width that is designed to be used for abdominal injuries and amputations. Pro Tip: Finally, add a package of QuikClot Advanced Clotting Hemostatic Gauze for more serious wounds. The most Simple 72 Hour Kits and Checklists must include an Israeli Bandage. While you’re at it, add one to each of your car emergency kits too. Have you ever used an Emergency Bandage like this one? Honey has been used in wound care for centuries, all the way back to the ancient Egyptians. Today, people swarm to Medical Grade Honey for it’s healing properties. What Is Medical Grade Honey? Made from New Zealand’s Manuka honey (Leptospermum species), *this post contains affiliate links MediHoney contains Methylglyoxal, a unique ingredient that provides it’s strong antibiotic benefits. Interestingly, pH content of Medical Honey is more acidic than any other honey, which means much faster wound healing. MediaHoney is the perfect addition to medical kits to use when with diabetic ulcers, open wounds, scrapes and burns. Toss a tube of it into your 72 Hour Kits and Emergency Kits too. Interested in learning how Activate Charcoal can get your through a tough stomach virus? We’ve done all the research for you. Use MediHoney in paste or gel form like any other wound cream. Derma Sciences also offers dressings for shallow wounds. One way I use Medical Honey is around my son’s g-tube site. This miracle honey helps with skin breakdown as well as protecting against inflammation. Then we have my son’s Remicade treatments causing eczema flares, and this stuff works wonders on eczema. No kidding. So. Medical Grade Honey Is Expensive. What is one thing that you refuse to go without, despite the cost? I live in a state that (usually) sees a lot of snow, especially in the mountains. Knowing how to survive hypothermia is knowledge every family living in a cold climate should master. Let’s talk about how to diagnose, treat, and prevent hypothermia. Hypothermia occurs when your body loses heat faster than it can produce heat, causing a dangerously low body temperature. Normal body temperature is approximately 98.6 F (37 C) Hypothermia occurs as your body temperature falls below 95 F (35 C), preventing your body from functionally normally. Hypothermia can be caused by exposure to cold weather or immersion in cold water. You survive hypothermia by warming the body back up to normal temperatures. The first symptom of hypothermia is often shivering, as your body attempts to warm itself. Because hypothermia often comes on so slowly, a person often has no idea of their condition. The confused thinking that hypothermia causes hinders a person’s ability to actually realize they are in danger. The first step in surviving hypothermia begins with preparedness before the event. You survive hypothermia by having a plan in place, just in case. This includes making sure you have the right gear with you when hiking, skiing, camping or traveling in winter weather. Remove yourself from the cold. If possible get yourself out of any wet clothes. Curl into the HELP position inside of a sleeping bag, blankets or an emergency bevy bag to reduce heat loss. (I love *this post contains affiliate links this brand and have them in all of our bug out bags. ) Hold your knees to your chest to help warm the trunk of your body. If you are with others, huddle together. Chemical heat packs are a must to help prevent and address hypothermia. Place a heat pack on major arteries to warm your blood, such as by the neck, under armpits and in the groin. Slowly warming the body’s core is most important, the extremities can wait. Wear the right clothing, including clothing that will prevent body heat loss from your head, face and neck and hands. Wear layers of loose fitting layers of lightweight clothing. You want your outer layer to be tightly woven, and water resistant. Stay as dry as possible. Get out of wet clothing as soon as possible. Pay special attention to keeping your feet dry, by having an extra pair of *this post contains affiliate links wool socks in your pack. Having a rechargeable hand warmer in your pack is also a good idea. Be careful not to overexert yourself, causing yourself to sweat a lot. Wet clothing and cold sweat will cause you to lose body heat faster. Always make sure someone knows where you are going and when you are expected to be back. This way emergency responders will know where to look if there is trouble. You may be surprised to discover that the risk of hypothermia during winter power outages is high, especially if you are not prepared. If you have access to health care don’t take any risks and get to a hospital immediately. If your only choice is to stay at home, here are some ideas to help mitigate the risks. Store wool blankets or cold weather sleeping bags. Have a way to heat water for soup or warm drinks to keep yourself both hydrated and warm. Consider investing in a quality indoor radiant heater. Pro Tip: Learn more ways to protect your family in severe winter weather. I can remember being worried each time winter grew near. How would I protect my family from severe winter weather if we lost power or had to leave due to an emergency in a snow storm. Taking the time to make a plan, and actually supply that plan in the form of emergency kits, is one of the best things I’ve ever done. I hope you’ll do the same.